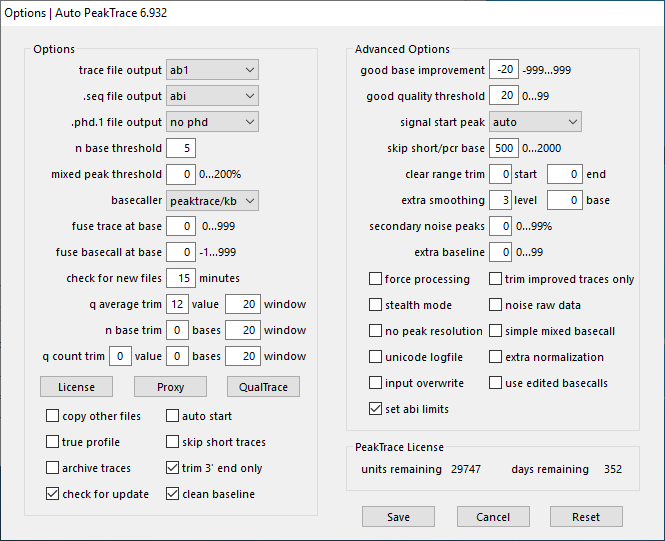 We have released Auto PeakTrace 6.932 and PeakTrace 6.932 for Linux and Windows. This is a small bug fix release that resolves issues on rare trace types, especially short PCR reads. We would like to thank those of our customers who sent us examples .ab1 files containing potential issues. Our policy is to never have known bugs in the latest release and once we are made aware of an issue we aim to rectify it as soon as possible (usually within weeks). If you notice any trace not being processed and basecalled as you expect, or any other issue of concern, then please get in contact with us. For users of PeakTrace RP the changes have been automatically made on the remote server side so there is no need to upgrade. PeakTrace:Box users can download the latest update from the PeakTrace:Box Downloads page. If you do not know the password to access the PeakTrace:Box Downloads page please contact us @support@nucleics.com or contact your local supplier for the update.